Whether or not you happen to own a Rigby rifle there is a nice selection of shooting accessories available from Rigby that are amongst the best that one could hope to get. The British are good at quality and at creating gear that is practical and even stylish. When we’re going out hunting we are best off with gear we can depend on, especially if things get difficult, and the accessories from Rigby are made to be dependable, and to last so well that your heirs may just finish up arguing over them when you are dead and gone. 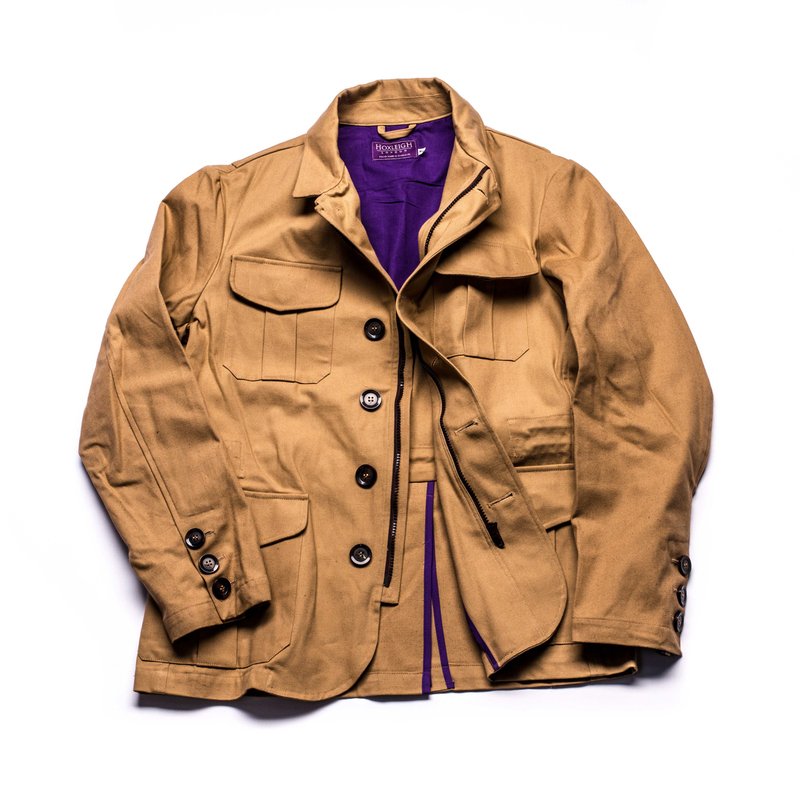 The shooting jacket by Hoxleigh of London is made in traditional safari style and comes in green or sand color. The shooting jacket by Hoxleigh of London is a traditional style safari jacket of the sort you may see in old photographs of people like Elgin Gates or Jack O’Connor. This jacket is currently on sale for £124.17 which is about half its previous price. It features four external and two internal pockets and an inner drawstring if it needs to be worn snug. 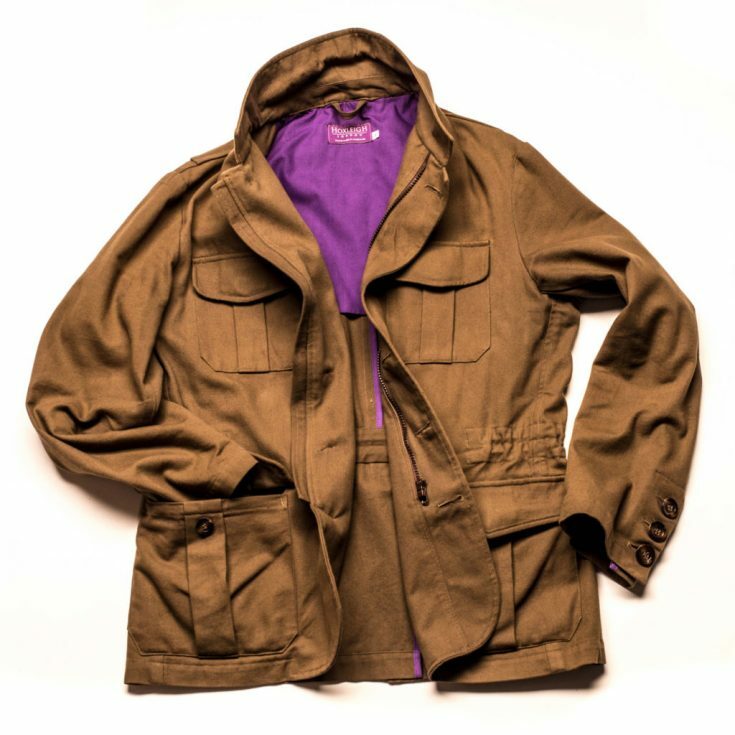 Available in “safari green” or “sand” colors it can of course be worn on safari, and anywhere else a jacket might be needed. You will find the Rigby shooting jacket by Hoxleigh of London if you click here. Standard caliber bullet pouch suitable for such cartridges as the .275 Rigby (7x57mm) and 30-06 etc. 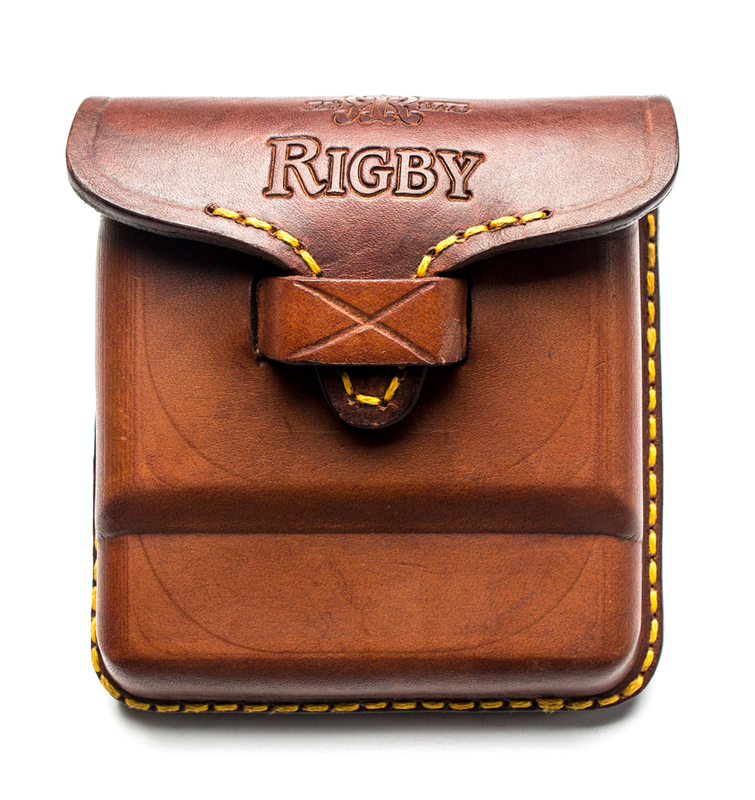 Rigby ammunition pouches are exceedingly sturdy and are hand made for Rigby in South Africa. 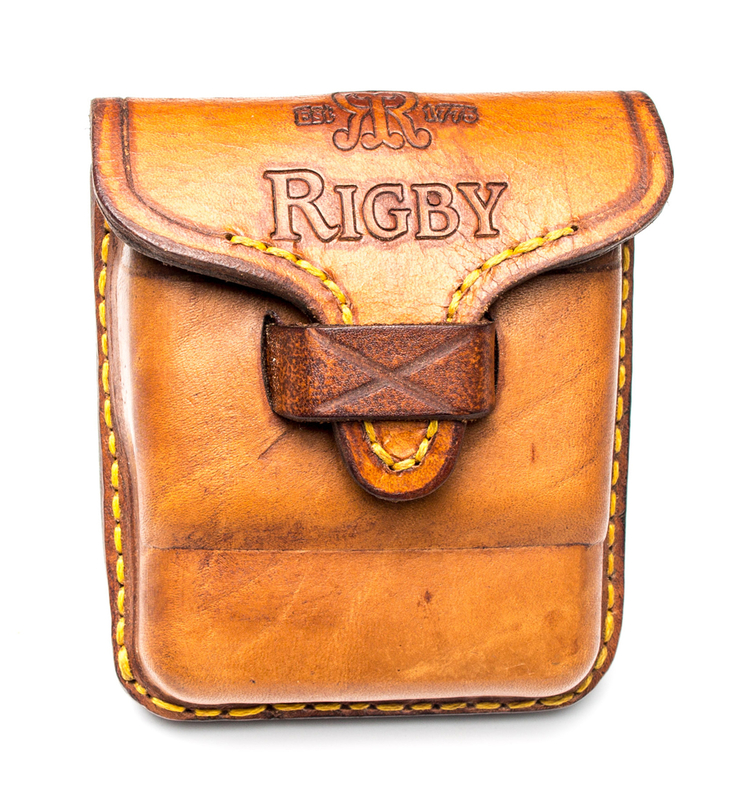 The Rigby standard ammunition pouch is embossed with the Rigby logo and holds five cartridges. 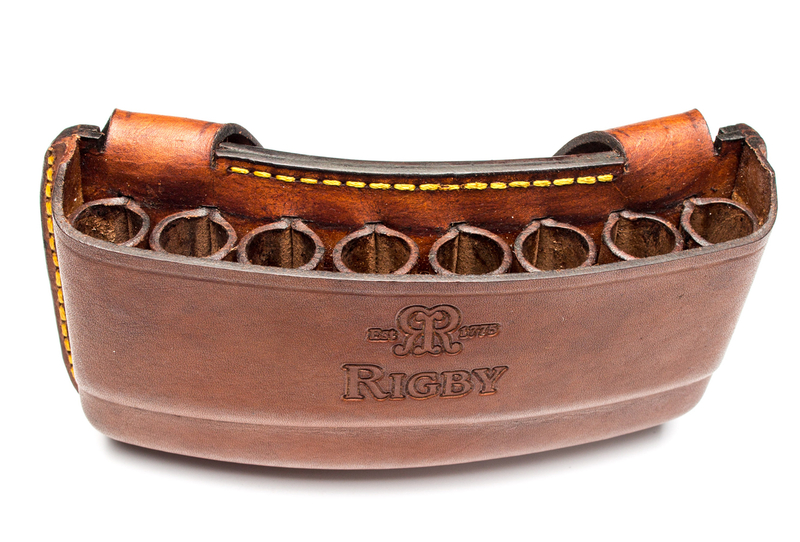 They are embossed with the Rigby double “R” logo and hold five cartridges. 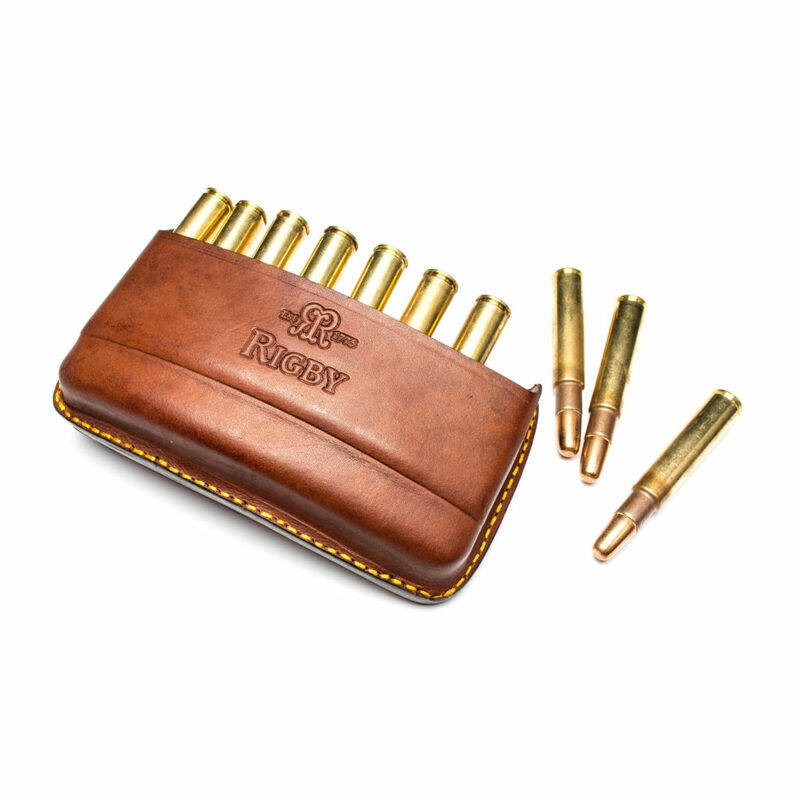 You will find the Rigby Standard Ammunition Pouch if you click here. The Rigby magnum ammunition pouch is suitable for calibers such as the .416 Rigby but should also fit such things as the .300 Winchester Magnum. The Rigby magnum ammunition pouch is made suitable for magnum calibers such as Rigby’s own .416. It is also hand made in South Africa for Rigby. The Rigby magnum ammunition pouch is sturdily constructed and likely to last more than just one lifetime. 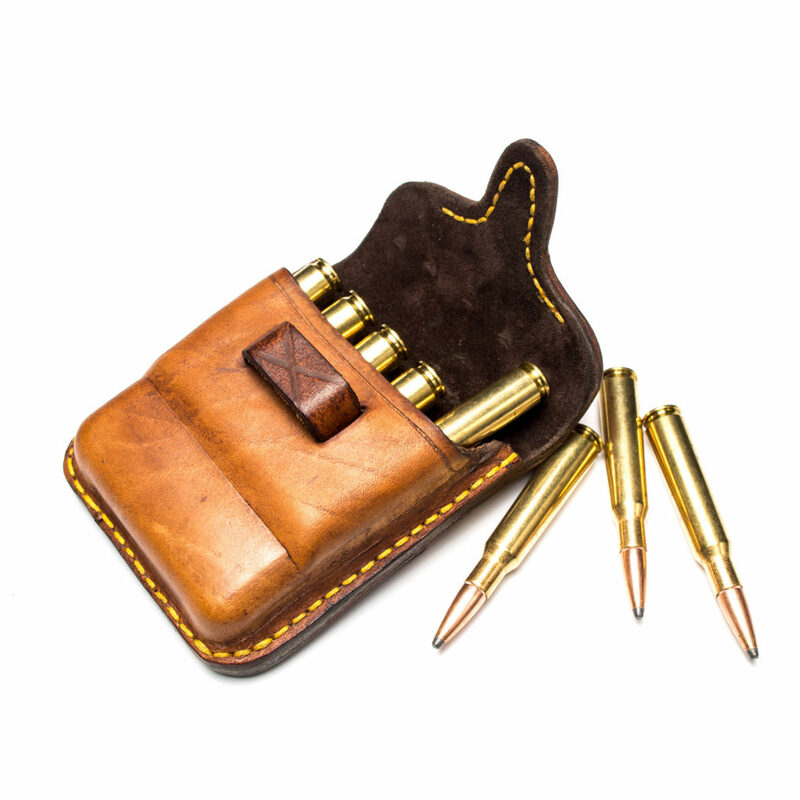 You will find the Rigby Magnum Ammunition Pouch if you click here. The Rigby Quick Load magnum ammunition pouch is kept open so that cartridges are instantly available. The Rigby Quick Load magnum ammunition pouch is open topped so that cartridges are instantly available just in case of close encounters of the unfriendly kind that might make fast access to cartridges a life saving feature. This open top pouch is of a style often used by professional hunters. The Quick Load style of pouch is normally worn at the front of the belt to make it easily accessible. 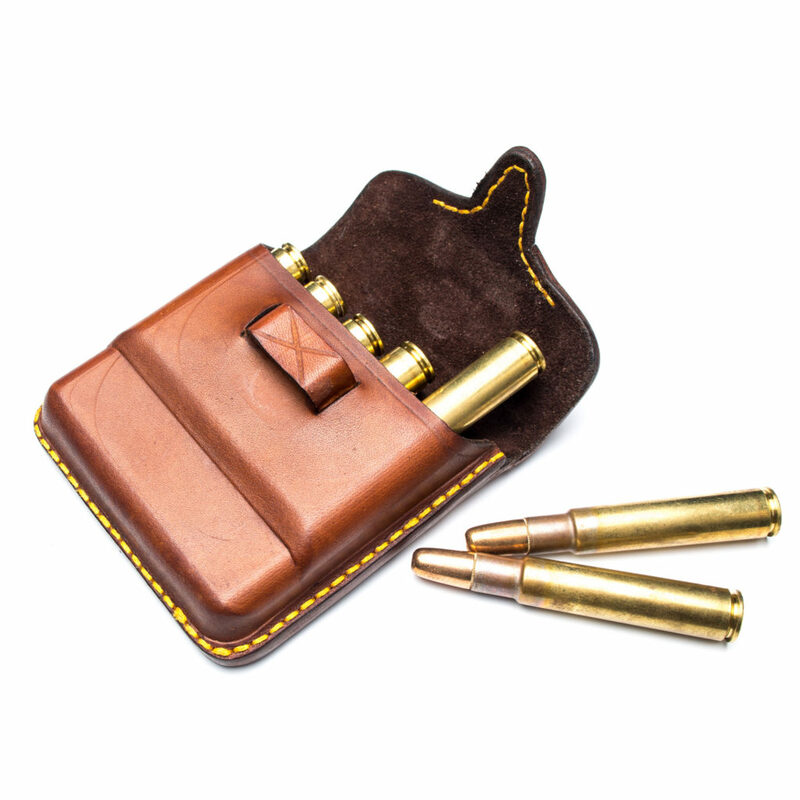 You will find the Quick Load Magnum Ammunition Pouch if you click here. 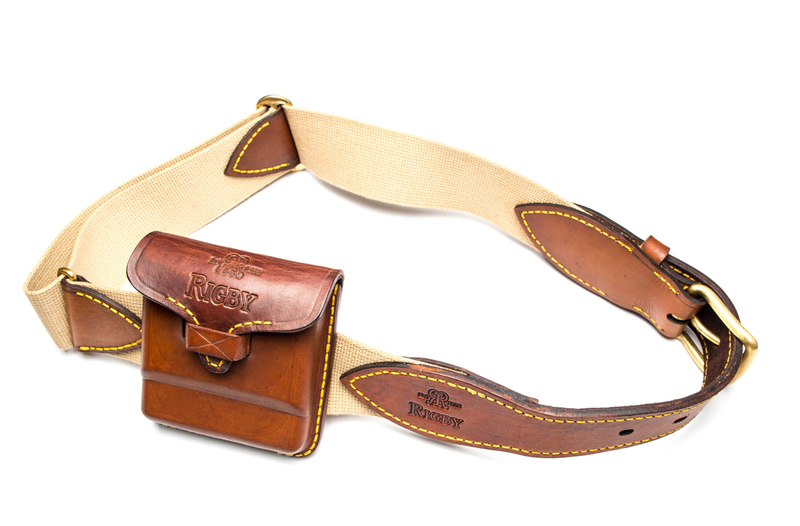 The Rigby canvas and leather belt is the perfect compliment to the Rigby bullet pouches. 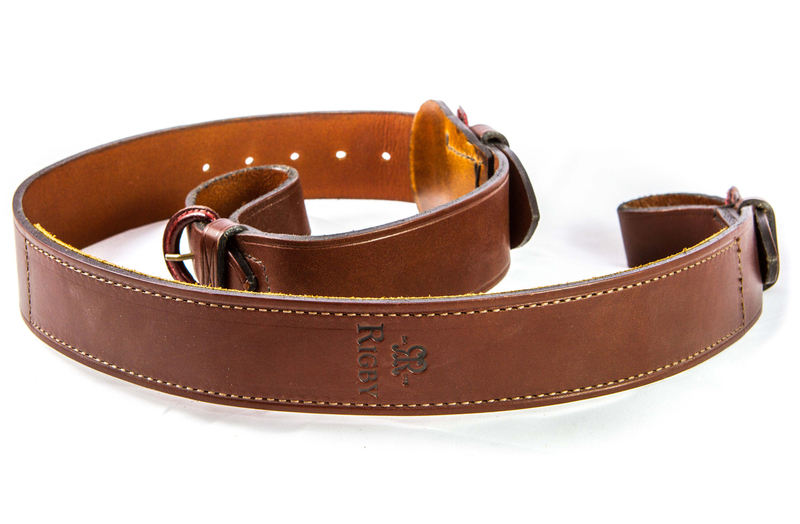 The Rigby canvas and leather belt is the perfect companion to the Rigby ammunition pouches and is made in traditional British style. 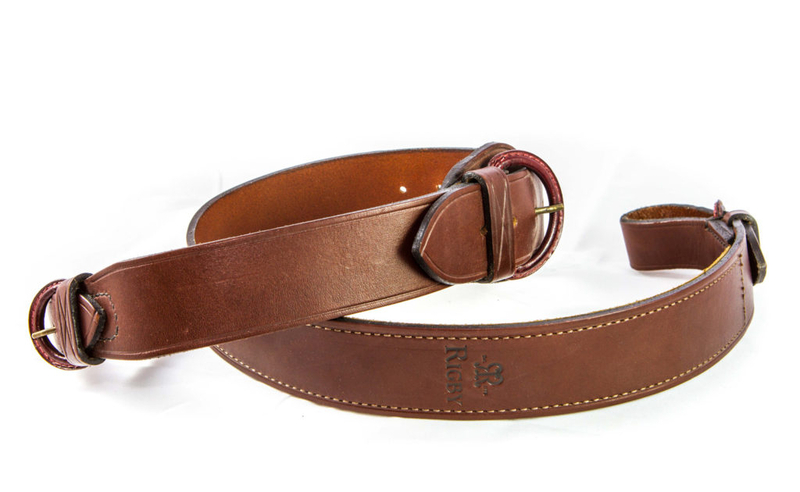 You will find the Rigby Canvas and Leather Hunting Belt if you click here. 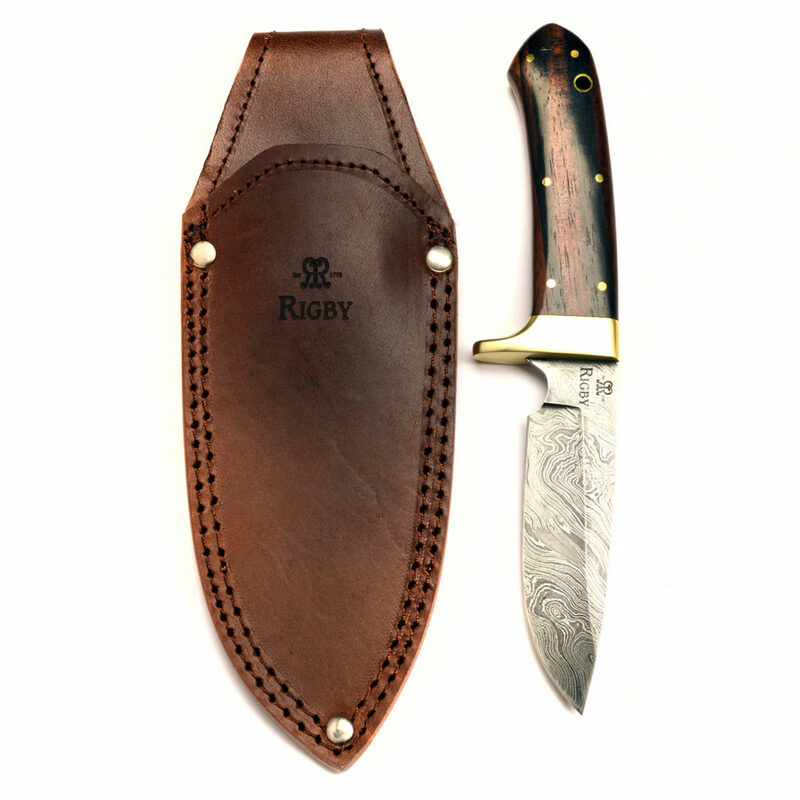 The Rigby “Kruger” knife is made in a very practical semi drop point style for field dressing and has a Damascus blade. The Rigby “Kruger” knife features a very attractive Damascus blade and is made in the semi drop point style which is so practical for field dressing game. It comes in a double stitched leather pouch suitable for left or right hand use. Priced at £165.83 this is an affordable top quality knife and would make a great gift for someone who is a hunting enthusiast. You will find the Rigby “Kruger” knife if you click here. The Rigby Silent Sling is designed to be simple and silent. The Rigby Silent Sling is designed to be as simple as one could possibly desire and yet absolutely dependable. You will find the Rigby Silent Sling with loop ends if you click here. Rigby Gunpowder Gin provides a perfect conclusion to a day out hunting, enjoyed either with tonic or unadulterated fresh from the bottle. Finally, what better conclusion to a day out hunting than Rigby’s unusual Gunpowder Gin. This gin is made exclusively for John Rigby & Co. by Blackdown Distillery. Blended with pure Sussex spring water and distilled in traditional copper pot stills, what sets this gin apart is the use of Japanese green gunpowder tea which gives it a unique and fascinating character. 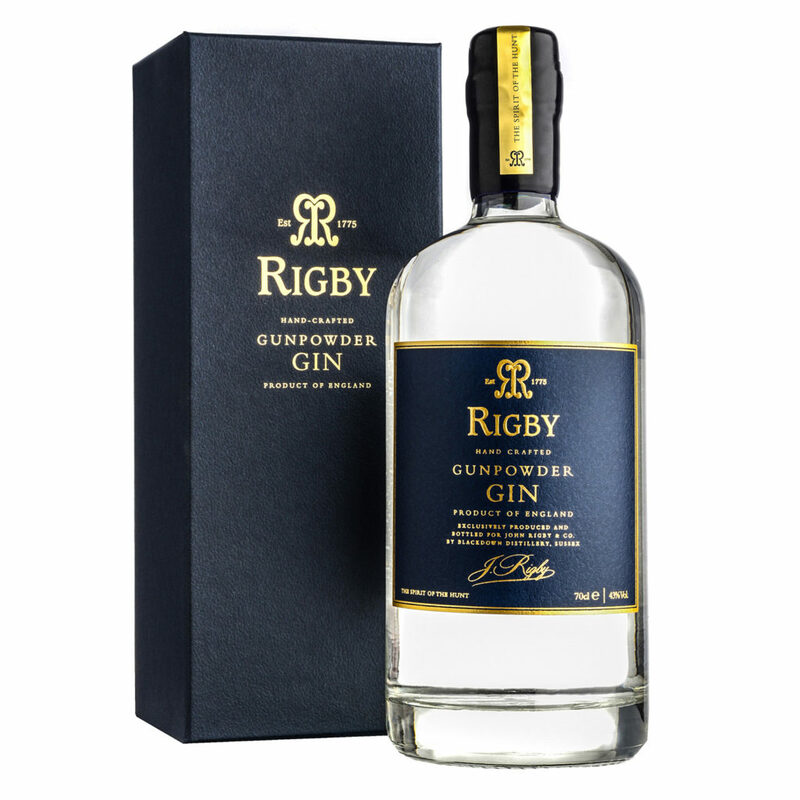 You will find Rigby Gunpowder Gin if you click here. John Rigby & Co. make some of the finest rifles in the world but they also provide some of the nicest accessories that add to the joy of hunting and shooting. If you are someone who appreciates the best quality conservatively styled equipment that will likely last more than one lifetime then John Rigby & Company’s line of accessories are well worth investigating.